The 50/50 (fifty-fifty) Guard is a grappling position commonly used in the sporting environment of Brazilian jiu jitsu. A guard is classed as 50/50 once two athletes involved in a grappling match become locked, with their legs intertwined (i.e. competitor A’s right leg around competitor B’s right leg,) thus providing the same set of circumstances for both players, which is the reason behind the “50-50” designation. This guard is often associated with stalling in BJJ’s competitive platform, particularly from the 2010’s decade onwards, when the complex rules of the sport where the ban on “knee-reaping” and the heel hooks allowed for the 50-50 to thrive under strategic purposes, and not to advance positioning as in the majority of other guard systems. 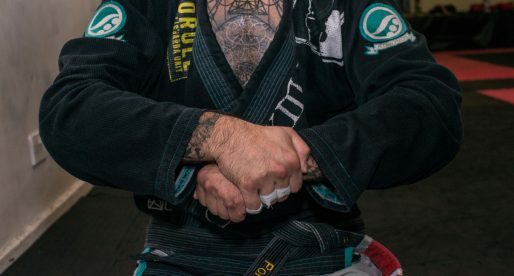 As mentioned several times before in our techniques section, the guard is not a privilege or a creation of jiu jitsu, and many of its numerous forms have been developed by countless other grappling styles across the world. 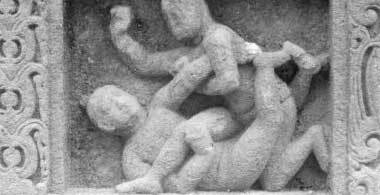 In the case of the 50/50, the earliest trace we could find of its possible origins came from a sculpture of a very rudimentary structure of the guard dating back from at least the 1500’s at the Khetappaya Narayan Temple in India (source: wrestlingsbest.com). 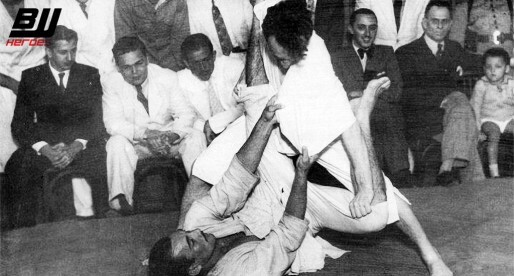 In jiu jitsu the guard has existed for many decades, however, and although reversals did exist from that position, it was not regarded as a thought-out guard concept, and more as a consequence of a grappling exchange. This is illustrated by the below footage, a match between Saulo Ribeiro and Roberto Roleta during the 1997 Pan American Championship, in which Saulo places Roleta in the 50/50 to avoid his guard being passed (you can see on the match in full on the video section). Prior to 2009, the highest profile match the jiu jitsu community had witnessed where the 50/50 was put to use, was the 2004 final of the World Championship open weight division between Roger Gracie and Ronaldo Jacaré, when the two athletes were entangled for a few minutes with Roger nearly getting a sweep (see full match below). Again, this was a consequence of a grappling exchange, as mentioned by Roger Gracie in an interview years after the match, and not an actual thought out game plan. Game planning and the 50/50 guard appeared a few years later. A process brewed in the lower belt divisions by Rafael and Guilherme Mendes. The two brothers paved the way for modern jiu jitsu around 2007/08, breaking through the scene with their innovative games. The style of the Mendes brothers brought a different flavour to the sport. One aspect of their game that quickly gained notoriety was the Berimbolo, a back attack that resembled a scramble coming from a variety of angles, but mostly from the De La Riva Guard and the Double Guard Pull. This Berimbolo scramble often led to this leg entanglement that we now call 50/50. Seeing this as an opportunity to enhance this “dead position” and be one step ahead of the game, Rafa and Gui as well as their team mates at Atos Jiu Jitsu such as Bruno Frazatto and Ary Farias dedicated plenty of thought to the position, developing a wide range of moves, from sweeps to back attacks from this enviroment. The new developments brought forward by the Atos team in the late 2000’s were quickly disregarded by the majority of the grappling community, particularly after the 2009 World Championship featherweight black belt semi-final between Rafael Mendes and Rubens Charles, a match where the two competitors were stuck in the 50/50 position for 9:30 minutes exchanging sweeps and futile Toe Hold attempts. This match would set the pace for countless others spent under the same circumstances. 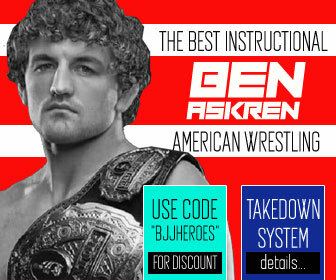 The objection towards this guard lied in the fact that when faced with the 50/50 guard, none of the competitors could/would advance in the match and move towards the submission, the ultimate goal of a jiu jitsu contest. Instead, both competitors were stuck in a battle for advantages, knowing that either could achieve a sweep, many started faking a sweep to get ahead on the score-board by an advantage, and wear down the clock – something that would take place more often when both grapplers were evenly matched. With this position the fight doesn’t move anywhere, it’s a strategic position to win on advantages, or by 2 points if they push for the sweep. It is a very ugly style, doesn’t let the match flow – Carlos Holanda, Tatame 08/2009. Many other big names of the sport including Fábio Gurgel (Tatame #162) and Rodolfo Vieira (link) spoke out, not against the guard itself, but against the way people were using it to slow the game down. 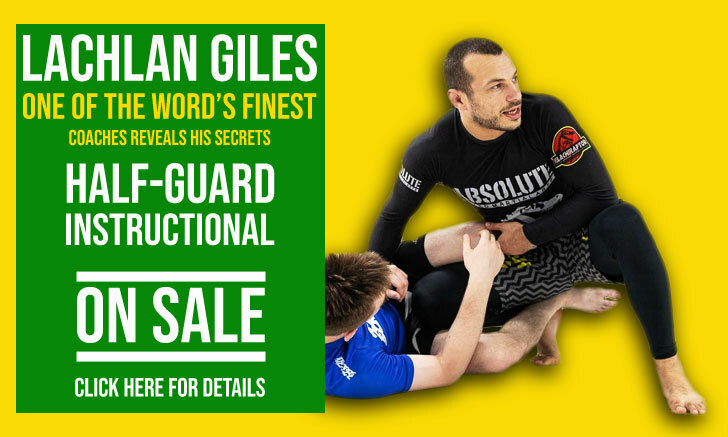 As aforementioned, the 50/50 guard was frowned upon by many, much like it had happened with previous additions to the Brazilian jiu jitsu game during the 1990’s, including positions now deemed “traditional” such as the Spider-Guard or the Toe-Hold. Slowly the 50/50 became accepted as just another chapter of the BJJ curriculum. With the acceptance of this guard, many of the sport’s top athletes began studying the position, adding their own imprint to the 50/50. One of the more popular uses for this leg entanglement became the “Botinha” lock, a variation of the Straight Ankle Lock made famous by Rodrigo Cavaca and his students (taught to Cavaca by Roli Delgado and Max Bishop). 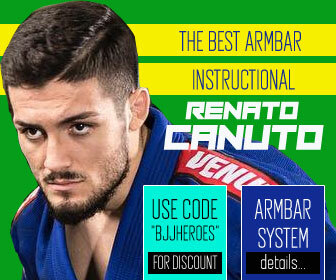 The guard has also been associated with the Leg Drag Guard Pass, a combination heavily pushed by the creative minds of Caio Terra, the Mendes and the Miyao brothers. Another team to support the 50/50 Guard “movement” at the time, was Team Lloyd Irvin, with Keenan Cornelius and JT Torres both applying Armbars from that position at the highest level. Submissions that generated plenty of “buzz” on social media at the time. Keenan Cornelius went on to develop a strong Lapel Guard which he also adapted to the 50/50. 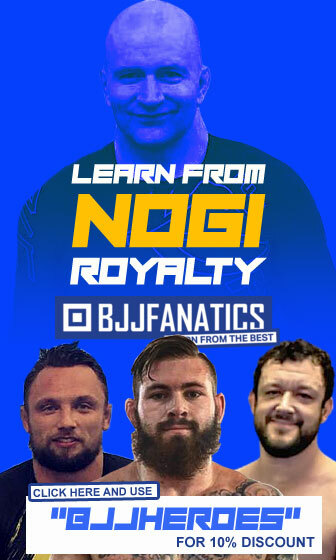 As Brazilian jiu jitsu is an ever evolving sport with new circumstances occurring every year, the International Brazilian Jiu Jitsu Federation (IBJJF) – the sport’s main ruling body – issues regular changes to its rules in an attempt to tackle imperfections in the scoring system. This was the case for the 50/50 Guard. On March 2015 the IBJJF changed their rules as a reaction against the stalling witnessed from the 50/50 context. The change banned advantages from being scored for “almost securing top position” (sweep). The intent of this rule was to force the competitors to implement a more fluid/forward thinking game, and penalize fighters who were contempt to stall and win matches on advantages. Banner picture taken by Callum Medcraft of Jiu Jitsu Style.